As spring quickly approaches, our home improvement desires take a turn and head to the outdoors. Homeowners frequently forget how important exterior illumination can be for them, their family and guests. 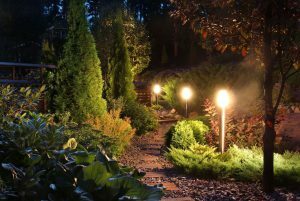 From the safety aspect to functionality and aesthetics, we want to share a few of the options for your home’s outdoor lighting. Pulling in the driveway, you might first notice the lighting connected to a home. Fixtures such as entry or garage sconces, hanging chandeliers, recessed cans and flood lights are either an entry recognition or security feature. We have all heard a well-lit home deters crime. “Outdoor security lighting is no longer just an item that you should do when you get around to it, it is now a vital part of the protection of your home and family,” says David Burtner, owner of Burtner Electric. When weighing electrical options, be sure to consider a timed system for the entry fixtures and a motion sensor for security fixtures, such as flood lights. Also, never forget to illuminate your house numbers in case of an emergency. Secondary to the home’s attached lighting, you might notice landscape illumination, which again, can be both aesthetically pleasing and a wayfinding feature. From paths, step risers, pool decks, to trees – walk your property and stand at unique views to determine where landscape lighting might best suit your needs. Combining several layers of exterior lighting presents the full package of a well-designed home. From the moment you, your family or guests pull in the driveway, the comfortable and inviting appearance this spring will make the statement your home has been longing for. If you are considering an addition of exterior or interior lighting, give your local professionals, Burtner Electric, a call. Visit Burtner Electric online at BurtnerElectric.com for more information or give them a call at 317-773-7663.